The Sky Is Not The Limit, the first book in the trilogy, is now on sale at Amazon and all good book outlets and of course, you can buy it here by clicking the box above. This is the story of the development of the largest portable structures available for hire in the world. The structures described are huge by any standards with some able to house up to 30,000 people at a time, covering more than four acres. The book covers the development of these huge structures, used for the most significant events ever held in tents around the world. It can be purchased by clicking on the Order a Book link above, Alternatively you can purchase the book from Amazon, Waterstones or any other major online book retailer. The book is currently on offer at £18 rather than the RRP of £28. The book covers the development of these huge modern structures over a period of the last 200 years, it also describes the history of tents as magnificent buildings in antiquity, as symbols of power and as inspiration for spectacular architecture. This book, The Sky Is Not The Limit, is intended to be the first of 3 tent related books. The book describes the industry background, development and use of the largest temporary structures for events in the world. 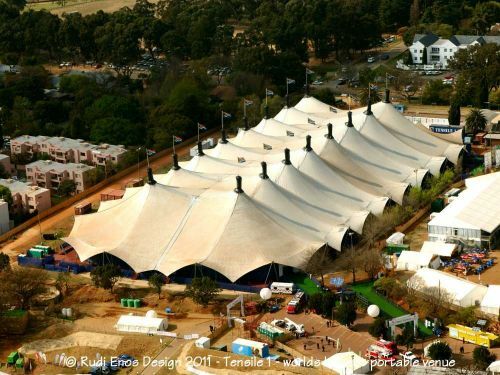 The second, The Book Of Tents covers all kinds of tented structures and provides an in depth The book describes the industry background, development and use of the largest temporary structures for events in the world. The second, The Book Of Tents covers all kinds of tented structures and provides an in depth appraisal of the design, analysis, manufacture and installation of tension fabric structures. The third Tents and Events is a reference on all aspects of temporary installations, stages, seating grandstands, tented structures, exhibition vehicles and an overview of health and safety issues of all of those. Reconstruction of the Hall of Hundred Columns.